Bamboo pillows offer some of the best sleep in the world. The natural fibers of a bamboo pillow ensure that it feels light, airy, and regulates temperature better than almost anything else. In short, they’re a dream to sleep on! We’ve set out to find the best bamboo pillows for sale. After lots of research and reviews, we’ve picked the top 10. Before we get to the reviews, here’s what to look for when shopping. Hypoallergenic: Have allergies? Then there is nothing more important than making sure your pillow is hypoallergenic. Bamboo pillows have a tendency to be more hypoallergenic than some others (down, we’re looking at you!). So make sure your pillow fits your life. Filling: What is the filling of the bamboo pillows made from? Everyone has their softness and texture preferences, so make sure this pillow fits your every need. You’ll get a better night’s sleep that way! Available Sizes: Pillows usually come in a few standard sizes. These are designed to fit the various bed sizes. Make sure you can get the sizes you need for the bed you have and your comfort before making a purchase. Washable Case: Do you want to be able to wash your pillowcase? Not all bamboo pillowcases are machine washable, and some are only hand-washable. Make sure your pillows can be cleaned how you want to clean them..
Dryer Safe Case: Do you want to be able to put your pillow case in the dryer? Whether to dry it after washing, to fluff it, or just to warm it up before crawling in bed, being safe for the dryer may be important to you. Dimensions: This stat will let you know the dimensions of the pillow. If the pillow comes in a variety of sizes, we’ll let you know the dimensions of the most common size available. This will be in inches, usually in length by width. 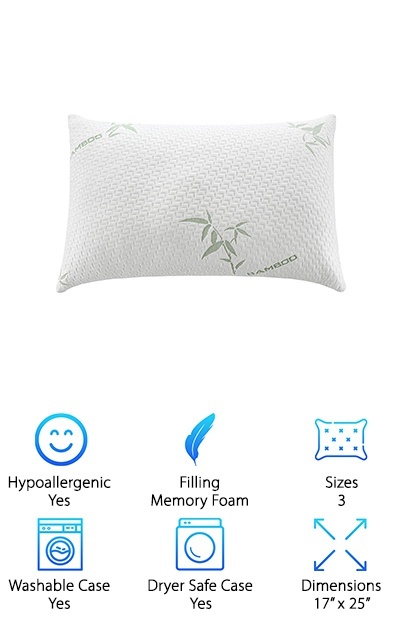 Looking for the best bamboo pillows for comfortable and deep sleep? You’re in the right place! You can find the list of our favs right below. 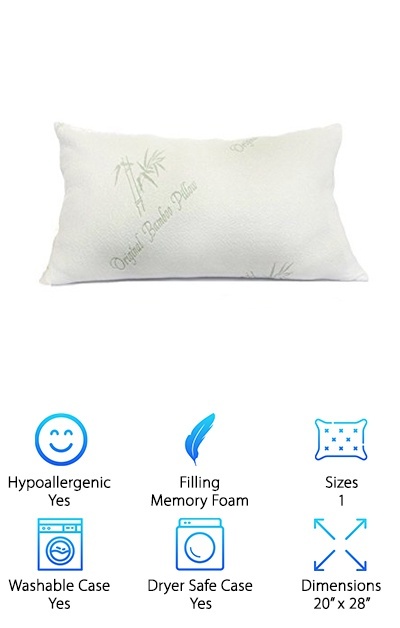 These bamboo pillows are ultra-soft, high-quality, and comfortable! If you’re short on time, look at the top pick and budget pick. Sweet dreams! The Zen Bamboo Premium is a one-of-a-kind pillow that makes us wish we could curl up with one right now for a nap. The pillow comes in two large sizes: the Queen size is 18 inches by 30 inches while the King size is 18 inches by 36 inches. The bamboo blend cover is machine washable and also dryer safe. It’s super soft and helps to regulate your temperature, so you don’t get overheated while cuddling up to it. These hypoallergenic pillows are also green; they are made with eco-friendly materials. The Premium also comes with a no questions 30-day money back guarantee, at the time of writing! But that isn’t the best part. These pillows are fully adjustable. The inside of the pillow is just stuffed full of these little bits of foam, and you can pull out some or add more in until the pillow feels perfect. Who says you can’t have it all? Looking for a high-quality pillow without the high-quality price? Check out the Equinox International Pillow! It’s our budget buy for a reason. Not only is the pillow inexpensive, but it’s also got some really great features that anyone will love. 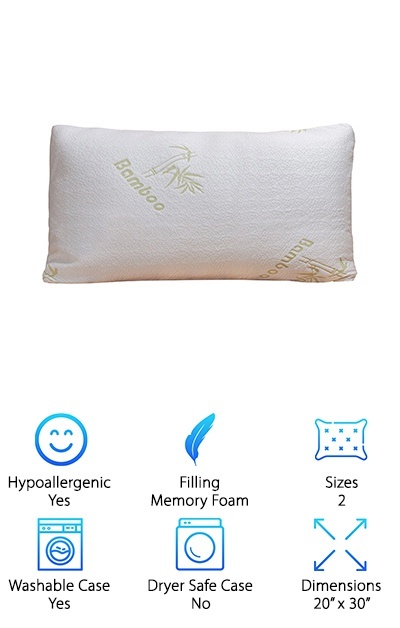 The bamboo pillow cover is padded and made of machine washable, breathable bamboo fabric that feels amazing. The insides are CertiPur shredded Memory foam. Also, the pillow itself can be spot cleaned with mild soap, just in case. It is one of the most comfortable pillows we’ve ever seen. Although it only comes in one size, Queen, it fits a standard pillow case and is the right size for pretty much anyone. It even comes with a 30-day money back guarantee. Since there’s no risk, you’d be crazy not to try it out! Want your pillow to remain cool, even in the hottest of summers? Bamboo pillows are the absolute best for this! And the Sleep Whale breathes like nothing we’ve ever seen before! The machine washable pillow case is 40% bamboo and feels soft and comfortable to the touch. The memory foam is adjustable and incredibly comfortable. And the hypoallergenic cover and insides keep away bugs, germs, and mites. 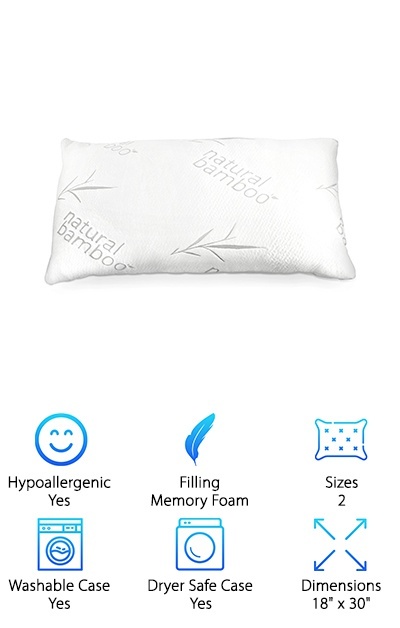 But the best part about this pillow is that it has a lifetime guarantee on it, which is better than any other bamboo pillow we’ve seen around. It’s also ultra-soft and conforms to your head and neck just like a good memory foam pillow should. If it came in more than one size, the Whale would have probably been our top pick! 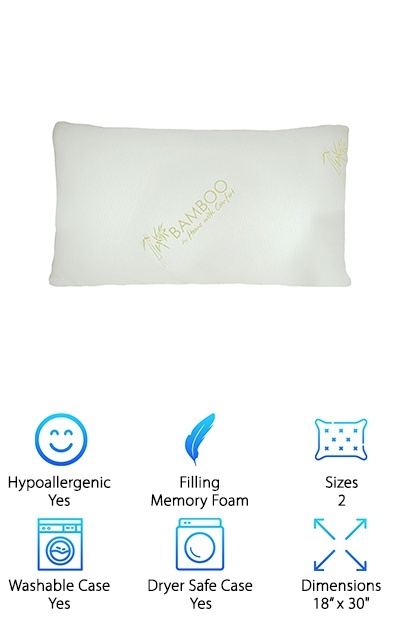 The Bamboo Sleep Memory Foam pillow is American designed and 100% filled with awesome! These babies come two to a pack, so you can get one for yourself and a loved one. Or hog them both! The single-piece memory foam is housed in a 40% bamboo case that is breathable. The foam is supportive, although not shredded to be adjustable. But the pillow is still soft and comfortable. The hypoallergenic design makes keeping it clean a breeze. The pillows are super easy to form to the right shape, too. Just pop them in a low heat setting in your dryer for about ten minutes before fluffing and shaping to your liking. Even if they fall out of shape, they are easy to fix. And they stay fluffy and comfy for years! The Home with Comfortable Bamboo Pillow is a lifesaver! 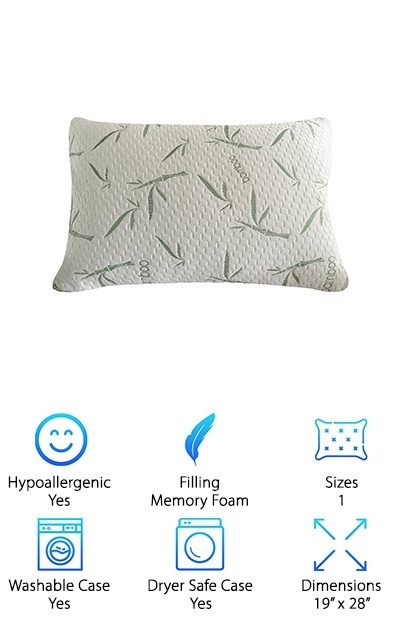 It claims to help with allergies (being hypoallergenic), snoring, headaches, and can even help with insomnia (if your sleeplessness is being caused by an uncomfortable pillow). It comes in two big sizes: the Queen is a massive 20 inches by 30 inches and the King is 20 inches by 36 inches! So if you like bigger pillows, this is where to find them. Like all the other memory foam pillows, these will keep bugs, mites, germs, and mildew out; the gross stuff just can’t grow inside. The bamboo case comes off with an easy zipper and can be washed and dried on low heat. So if you are looking for an oversized pillow that offers some relief, check out the Home With Comfort pillows. 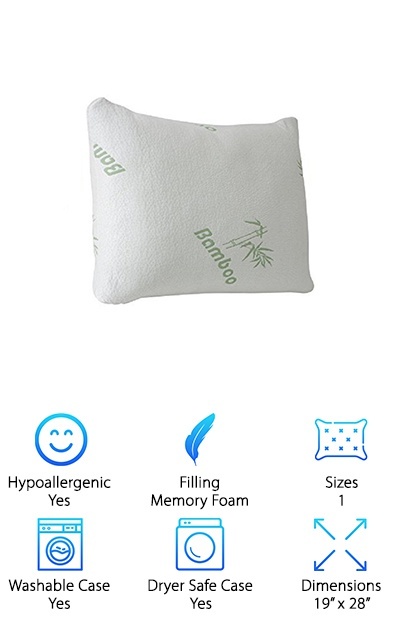 The SmartSOFT foam inside of the Original Bamboo pillows is 100% unique. We love to see a little innovation in our pillows, and this one has it. The two pack of pillows contains shredded memory foam like many of the others on this list. However, this special memory foam is made up of a variety of different sizes and thicknesses. This ensures that the foam will form to your neck and head better than any of the others. It feels like sleeping on a cloud! Also, the Original is hypoallergenic and clean with easy care instructions. Unlike many of the other pillows on this list, it weighs more than 4 pounds! While it is very comfortable and feels great, the weight might make it a little uncomfortable for those new to the memory foam game. Still a great deal for great pillows! If you want to read some glowing bamboo pillow reviews, the Snuggle-Pedic has them! These pillows are American-made and come with a 90-day “sleep trial” money back guarantee and a 20-year warranty. No wonder everyone seems to love them! 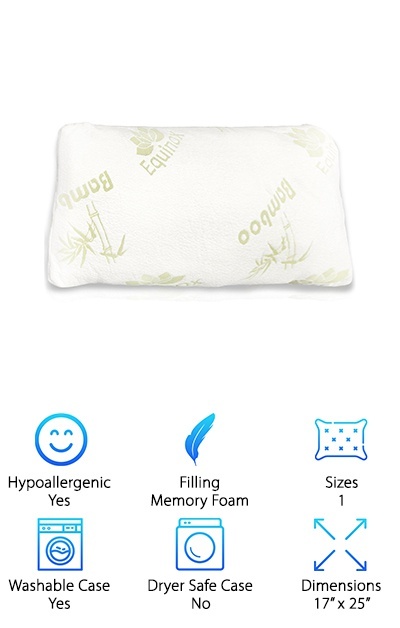 The whole pillow is machine washable unlike most bamboo pillows because it is made from Eco-Friendly Biogreen and Certipur-US Certified Foam. These beauties are made and sold by Relief-Mart, an American company that has been making mattresses and pillows for 15 years. This pillow’s case also contains one of the highest bamboo contents we’ve seen; it’s 43% bamboo fiber. The shredded foam on the inside is removable for 100% customizable sleep. It even comes in three sizes: standard, queen, and king. We love everything about the Snuggle-Pedic Ultra-Luxury! We like Home With Comfort’s pillows so much, we put them on this list twice! Like the first pillow, these are hypoallergenic, Quality Poly Fiber shredded memory foam that is fully adjustable to your body. It comes in both king and queen sizes. The padded bamboo covering is easy to clean and incredibly soft. These pillows also claim to help with whatever plagues you; a good night’s rest can solve so many health problems! The only concern we have with these pillows is how massive they are; you definitely can’t use standard pillow cases for these big boys. But it’s certainly worth it if you like big pillows! The best part? The pillows feel really sturdy and supportive without feeling like you’re sleeping on a brick. And who doesn’t love support? The Alveo Premium is the firmest pillow on this list. If you love super firm pillows, this is the one for you! The bamboo cover contains 15% bamboo and 85% microfiber, helping to keep you cool while sleeping. It is incredibly supportive and comes in three sizes: standard, king, and queen. These pillows are not oversized and will fit in the pillowcases you probably already own. It comes with an awesome 5-year warranty so you know you’ll be getting the best night’s sleep you can for years to come. Want to know the best part? 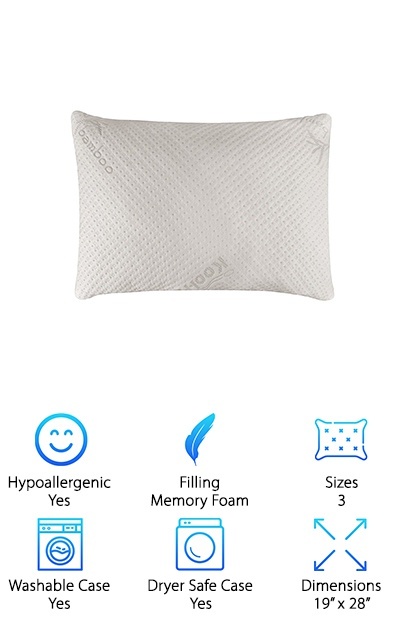 Here’s the scoop: these nifty pillows come with side panels designed to help with airflow, keeping you extra cool and comfortable during the night. How’s that for ingenious? 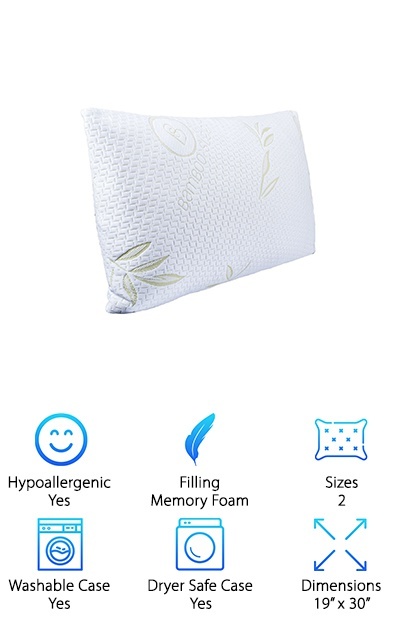 This two pack of queen-sized pillows from Plixio is a great bargain. The shredded memory foam is comfortable and breathable. The case is machine washable and is 40% bamboo. We think they are great no matter how you sleep, whether it’s on your side, stomach, or on your back. Plixio claims their pillows will “never go flat!” and they have a two-year warranty to back it up. The Plixio pillows are comfortable and supportive without being too firm or too heavy; these guys weight a little less than three pounds each. We liked them for their great price, but we loved them for their amazing stain resistance! Once these pillows fluff up, they won’t let you down.